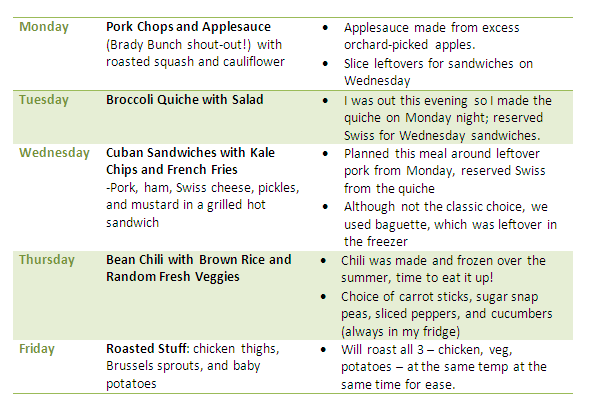 Occasionally, I post my weekly meal plan in an attempt to keep myself on track with said meal planning. This week I’m a bit late in posting – it’s been somewhat hectic because I was in the city overnight on Tuesday to see Lionel Richie in concert. (Verdict: He’s still got it, and I still love it. Truly!) The recipe I have for broccoli quiche is super easy. It’s included below for your brunch-for-dinner enjoyment. 1. Beat together the following: 1 1/4 cup milk, 1/2 tsp salt, 1/4 tsp pepper, 3 eggs. 2. Cut a small head of broccoli into small florets (about 2/3 cup). Blanch these in boiling water until bright green, about 2-3 minutes. Drain. 3. Chop 1/2 red onion and mince 1 clove garlic. Sauté the onion and garlic in 1 tsp olive oil over medium-low heat until the onions are translucent. Add cooked broccoli and mix well. 4. Grate 3/4 cup Swiss or jarlsberg cheese.